"The Little Yellow Train,is part of the French state rail network, run by the French train operator SNCF. Consequently, tickets come at standard French train rates" which would suggest that Interail passes can be used. "Caution, during the summer, discount cards are not accepted." We would be travelling in July, is the Interrail pass considered a discount card? If the Interrail pass valid on the line alone or is a reservation needed? Interrail est valide sur les trains suivants gérés par la SNCF (compagnie nationale): TGV, Intercités, TER ainsi que Thalys et Eurostar. ... exploitée par la SNCF comme partie intégrante du réseau TER Languedoc-Roussillon. i.e. it's part of a TER line. I think that this fact should be enough to confirm that Interrail passes are accepted, especially since they're technically not a discount card. Also the route from Perpignan trough the Pyrenees (Little Yellow Train) to Barcelona is free [with Interrail]. I'd certainly expect them to mention any exceptions on that page if they existed. I did this as part of interrail so it was obviously good value for money for me as I didn't have to pay. I went from Villefranche-de-Conflent to Latour-de-Carol on the yellow train. Unfortunately this reviewer was travelling in March, so it doesn't help with the "summer" aspect. Not the answer you're looking for? Browse other questions tagged trains sncf interrail or ask your own question. 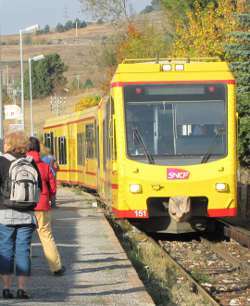 Can Interail passes be used on the Mulhouse tram train?